The Log Cabin Museum was built in 1976 as the Bicentennial Project for Fairfield Bay. 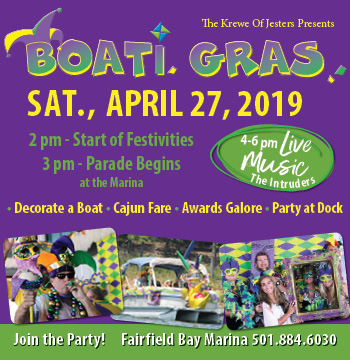 It was financed by State and Federal grants and matching funds from the Fairfield Bay Community Club, and land donation from Fairfield Communities Land Company. 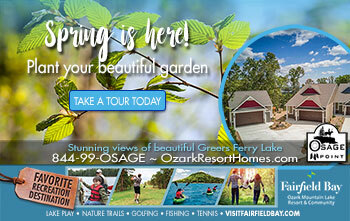 It was erected by an all-volunteer labor force of Fairfield Bay residents. Contents of the Museum range from fashions and jewelry from the past, stuffed local birds and animal specimens, a colonial American flag, an arrowhead collection, dolls, quilts, and communication devices from the “olden days.” A Metaces and Mano (Mortar and Pestle) were found on the golf course and have been documented to be around 4000 years old. There are also many artifacts and historical papers chronicling the history of this area from prehistoric times through the centuries of Indian habitation to the present. Many of the items have been donated for permanent display or loaned to the Museum by local residents for changing exhibits. Sometime in the late 1950’s, Hobart Hooten bought 49 acres of land, which included the Indian Rock Cave. He sold the section of land by the river to the United States Government when they were preparing to build Greers Ferry Dam and the lake it created. 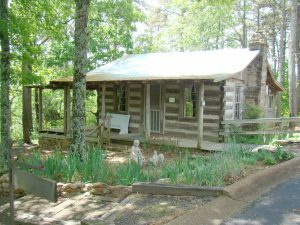 Mr. Hooten then moved an existing log cabin, believed to be from around 1850 to its present location atop Indian Rock Cave. The home’s logs were chinked with cement instead of mud and straw. 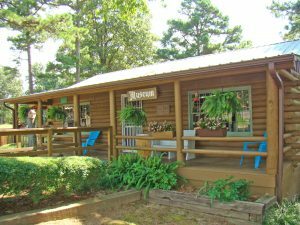 The cabin was used by Mr. Hooten to sell tickets to see the Indian Rock Cave (tickets were ten cents each) and his wife used it as a craft store. After Fairfield Communities, Inc. bought and developed this area, the residents of Fairfield Bay again used the cabin to sell craft items. The Log Cabin gives us a taste of home life in the late 1800’s. The fireplace was constructed from local stone with a mantle of rosewood, walnut and pine. The original “trundle-style” bed, complete with a corn shuck mattress stands against one wall. A variety of tools and household items can be seen along with clothing and toys, a loom and a weasel or yarn winder. A kitchen, separate from the original log cabin, is in the “back room” and it holds many items that the “lady of the house” might have used in the mid to late 1800’s. The Indian Rock Cave, also known as the Indian Rock House, is a natural structure, which sheltered primitive people as far back as 1000 B.C., and more recently served as a tribal meeting place for local Indians. 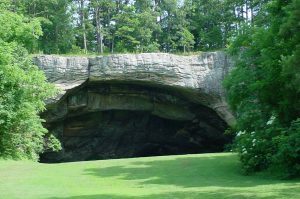 The sandstone cave measures 100 feet across, 50 feet high and 97 feet deep. Natural springs flow along the rear of the cave and have hollowed out this grotto throughout the years. Shifting boulders have created secondary rooms and tunnels running behind the cave giving exit on the other side of the bluff. Many petroglyphs indicate the presence and activities of large groups encamping there including the Quapaw, one of the twelve Dakota tribes who overran the mound builders who had long inhabited this area. Many of the glyphs etched in the rocks were determined to have been made during the unusually difficult winter of 1776 when Indians from the Cherokee, Shawnee and Delaware nations used the Indian Rock House as a refuge during the 16 days of freezing weather. The last glyphs (other than some modern day graffiti) appear to be dated 1828. 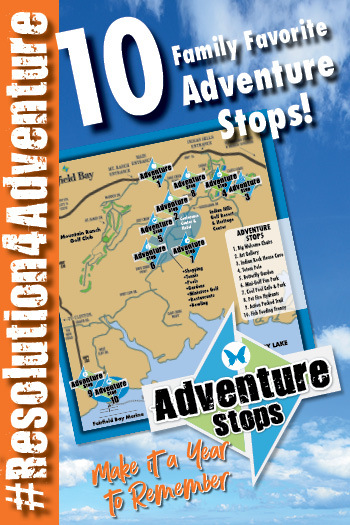 In 1969, the Indian Rock Cave/House was sold by the owner Hobart Hooten to Fairfield Bay. At some point, possibly to protect the glyphs by putting them out of reach, the floor of the cave was lowered ten feet. Inadvertently, many artifacts were destroyed. It remains, however, a masterpiece of nature. It is listed on the National Historical Registry. The unique American Totem Pole was carved by the Woodcarvers Unlimited Club of Fairfield Bay to commemorate the 200th anniversary of the signing of the Bill of Rights. The American Totem Pole was carved from an Arkansas Red Cedar log contributed by a local logging firm. 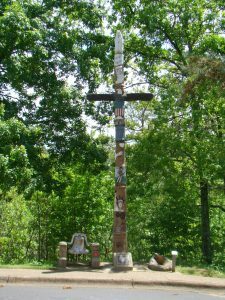 The woodcarvers divided into teams who, over a year’s period, carved and painted the symbols on this historical totem. The symbols are: Hands of the Creator: Freedom of Religion; Bill of Rights: 200th Anniversary; Scroll: We The People: The Constitution; American Eagle: National Bird and Colors; Liberty Bell: Symbol of Independence 1776; Clasped Hands: Melding of Races in USA; Minute Man: First Line of Defense; Statue of Liberty: Liberty Enlightens World; Industrial Factory: Industry’s Contribution; Crossed Mallet and Chisel: Woodcarvers Unlimited Logo. The Totem Pole was dedicated July 4, 1992.